A very successful emulation of a signature Abbey Road effect, but we'd like more control over the specifics of the tape deck. Fabulously warm sound. Particularly realistic ADT effect. Intuitive interface. Good stereo width effect. No biasing or tone controls. Slowing/speeding effects not fully realistic. No feedback facility. We're surprised it's taken so long for Abbey Road's signature artificial double tracking sound to be worked into a plugin, but then a similar effect can be achieved using modulated short delays, because that's essentially what Waves' ADT is. The defining features of 'real' tape ADT, as invented by the Abbey Road engineers, however, are 'negative' delay, vintage valve colouration and tape saturation, random Varispeed modulations, and wow and flutter. 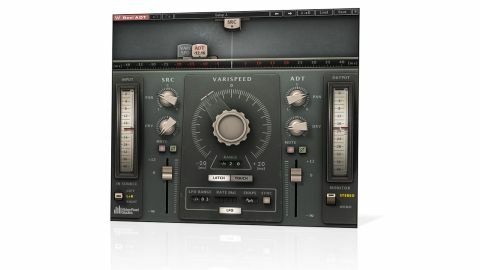 Waves' Abbey Road Reel ADT plugin (VST/AU/ RTAS/AudioSuite) certainly looks the part with its metallic grey fascia and big knobs. It comes in mono and stereo formats, as well as a mono-to-stereo version and 2V versions (stereo and mono-to-stereo), which add a second modulated signal for ATT - that's Automatic Triple Tracking. "A delay time slider in the guise of a moving analogue tape head sets the ADT delay time pre or post the main source signal"
The GUI is beautifully intuitive. A delay time slider in the guise of a moving analogue tape head sets the ADT delay time pre or post the main source signal, with a range of +/-20ms. The big Varispeed knob (Varispeed being the control used to manually adjust the speed/pitch on old tape decks) then sets the speed of the second tape machine, thus adjusting the delay time of the second tape machine relative to the first over a +/-20ms range, for a total range of +/-40ms. An LFO with Range, Rate and Shape further modulates the delay time, and an animated tape head visualises the modulation. Again, the Range is limited to +/-20ms and you get a variety of waveforms to choose from, including sine, triangle and random. The Rate (speed) can be synced to tempo or freely set in Hz. On either side of the Varispeed knob are level, mute, pan and phase controls for both the source and the ADT signal, as well as a Drive control for dialling in the sort of warm and cosy saturation you'd get from a vintage valve reel-to-reel machine. Reel ADT is one of those effects that you fall in love with as soon as you hear it. On vocals it imparts a gorgeous warmth and creamy thickness, and nothing you do can ruin it. The same applies to lead instruments, which benefit from being glued nicely into the mix. Also notable is the width you get from panning the source and ADT signals. Further, short delay times and modulation can create flanging effects (as you'd hope, given that said effect got its name from the process of slowing a tape down by pressing on the reel flange). Similarly, put the ADT signal out of phase and you get a natural phasing effect. It's just a shame there isn't any built-in feedback routing. The Varispeed knob has Touch and Latch settings: in Touch mode, it jumps back to zero when released, generating a 'wowing' sound. More could have been made of this - adjustable glide times and 'resettling' ballistics would have helped to emulate the wobbly way a real tape machine drops back to normal speed. Also slightly disappointing is the total lack of bias and other tone-shaping tape controls. Nonetheless, Reel ADT looks good, feels good and sounds good. Despite a few missed opportunities, it's a classic-in-waiting, creating a sound way more impressive than you could ever get from a straightforward short delay. And, obviously, it's an absolute necessity for Beatles fans.